Mon-Fri 7AM-5PM. 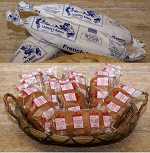 The LeJeune family bakes French bread and ginger cakes with the same machinery and recipes since 1884. On National Register of Historic Places. Free tours by appointment.